You can keep your high-speed quad chairs and 2,500-foot vertical drops, says novelist and mediocre skier Brock Clarke. 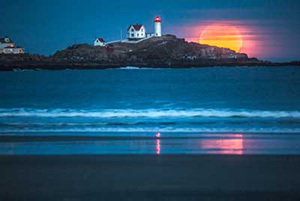 Maine’s mom-and-pop community hills have a charm that the biggies can’t match. [T]o paraphrase a famous Saturday Night Live skit from my youth — starring a hilarious Martin Short as a synchronized swimmer in a life jacket — I am not that strong a skier. This is not to say I don’t enjoy downhill skiing, and it’s not to say I haven’t been doing it for a very long time. I first went skiing 37 years ago, on Shu-maker Mountain in Little Falls, New York, a small hill in a small town centered around dairy farms and a paper mill, in the foothills of the Adirondacks. I remember standing atop that mountain as a kid, looking down from the lip of its toughest trail, a terrifyingly moguled drop called the Headwall. I remember the transcendent feeling of looking north to where the Adirondacks loomed, magnificent and mysterious in the dusk. And I remember pushing forward, praying not to die, or at least not to make a fool of myself by wiping out on the Headwall yet again. In other words, for me, skiing is about the sublime — except for all those other times when it’s about survival. It’s no surprise, then, that I’m attracted to those ski mountains and towns whose stories are also survival stories. 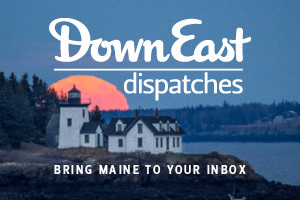 I’m not talking about Maine’s marquee ski hills, where double black diamonds are as ubiquitous on the trails as Massachusetts plates are in the parking lots. No, I’m talking about the little mountains, the mountains whose identities are tied to their towns and counties and not to condo associations. While they may not have the vert or the pizazz of beloved heavyweights like Sugarloaf or Sunday River, Maine’s community ski hills are where memories are made, first turns are carved, and gallons of hot cocoa are consumed. The conspicuous presence of Canadians — who make up 40 percent of all Bigrock skiers, according to general manager Bill Getman — is one reason why skiing at Bigrock doesn’t feel like skiing in Maine. 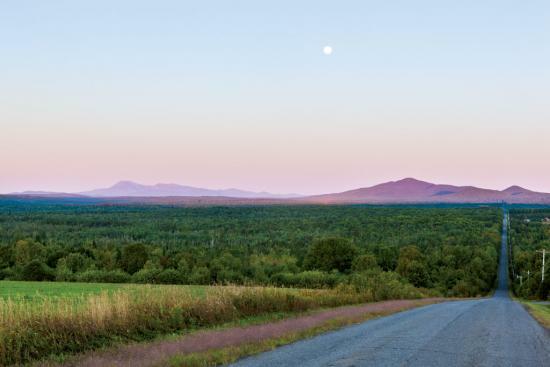 The surrounding Aroostook County landscape is the other: it’s more Nebraskan than Appalachian. In most ski areas in Maine, when you get to the top of the mountain, you look around at other mountains. When you get to the top of Bigrock, you look at fields, miles and miles of fields. And when you get to the bottom, you look back up at the 1,000-foot peak and kind of wonder what it’s doing there, out in the middle of all these fields. Among the many good things about skiing Bigrock, this is one of the best: you feel like you’re doing something you shouldn’t be able to do. What a miracle, you think, to downhill ski in this place! And what a miracle it costs so little to do so! Because that’s another good thing about Bigrock: it is shockingly cheap to ski there. A weekday adult lift ticket costs $22 and a weekend ticket $38. You are perhaps thinking, hey, it’s cheap for a reason. But no, the snow on my last visit was quite good, there was no shortage of it, and the slopes were plenty challenging — for me, certainly, but also for skiers more expert than I. The skiing was so good, in fact, and the lift tickets so cheap, I kind of felt like I was getting away with something. This is one of the challenges of running a small ski hill like Bigrock: you have to convince people that it’s worth visiting. One of the ways you do this is to make it a bargain, but if you make it too much of a bargain, you’ll eventually go out of business. As manager Getman told me last year, “If you want to end up with a little bit of money in the ski industry, you have to start out with a lot.” An affable, tan, mustachioed man who looks a bit like Harvey Korman, Getman was more interested in talking about fall lines than finances when I visited, and I understood why: small hills face long odds, but it’s hard for skiers to feel the miracle of skiing in a place like Bigrock if they’re busy thinking about how long that miracle will last. The skiing was so good, in fact, and the lift tickets so cheap, I kind of felt like I was getting away with something. I do, which maybe explains why I also love Black Mountain in Rumford, one of Maine’s most famous paper mill towns. In some ways, Black Mountain is a much more traditional kind of ski mountain than Bigrock. When you get to the top of the chairlift, you see not potato fields but Maine’s magnificent western mountains (Black Mountain board president Roger Arsenault says that the hill’s biggest challenge is that it’s “caught in the middle of ski country”). 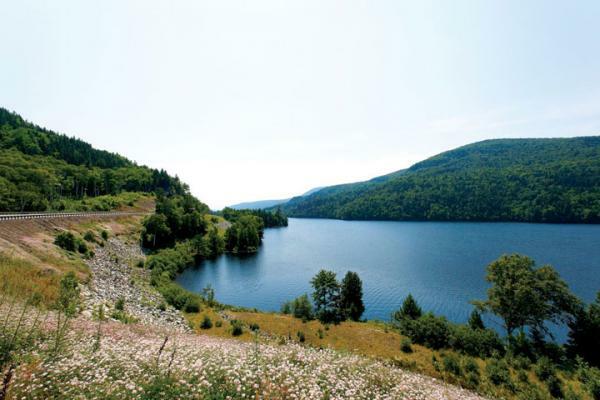 But it’s also true that from the top of Black Mountain, you’re likely to get a strong, sweet whiff of the Rumford mill. And when I say that smell is sweet, I mean this with absolute sincerity. The thing is, when I visit one of the Northeast’s headliner ski resorts, I get the alienating feeling that these places exist not in Maine or New Hampshire or Upstate New York, but rather in the independent state of Alpinia, which celebrates its own culture and has all its food brought in by Aramark. In a place like Black Mountain, though, you feel like you’re skiing someplace where actual people live and work, where the fate of the mountain and the town are inextricably intertwined. 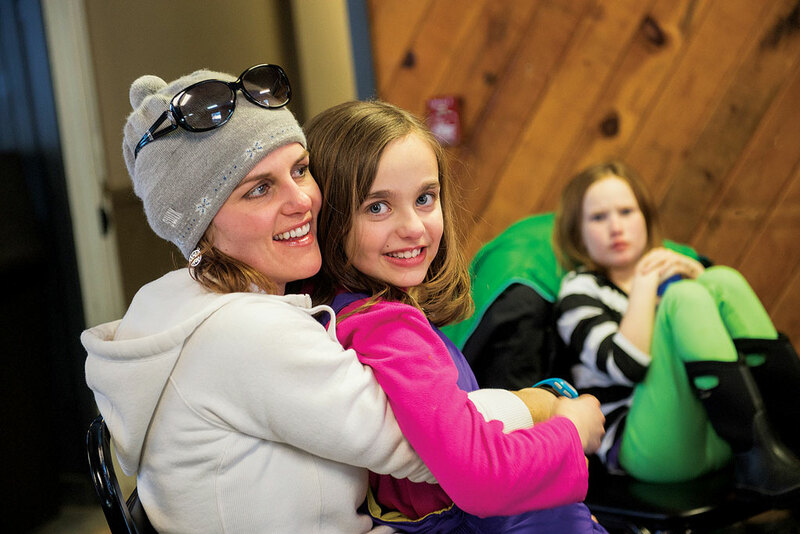 Every winter weekend, laid-back ski areas like Bigrock Mountain in Mars Hill fill up with families, newbie powderhounds, and savvy diehards looking for great terrain on the cheap. The result is that the place is full of characters, folks like Wendell “Chummy” Broomhall, a nonagenarian Mexico, Maine, native who competed as a Nordic skier in the 1948 and 1952 Olympics. Broomhall has been heavily involved in creating the Nordic trails at Black Mountain, and he’s full of interesting stories about the grisly ski jumping accidents he used to witness before the insurance companies stepped in and ruined everything. Broomhall grew up skiing around Rumford, and board president Arsenault learned to ski on Black Mountain. The pair are emblematic of another characteristic of mountains that are tied to their towns: they’re full of folks who carved their first turns there and are now teaching their kids and grandkids to ski there too. You feel like you’re skiing someplace where actual people live and work, where the fate of the mountain and the town are inextricably intertwined. This is especially easy to do at Black Mountain, where lift tickets start at $15. Yep, you read that correctly. How, you might wonder, can a ski area possibly stay in business when its lift ticket costs less than a nice lunch at Sunday River or Saddleback, just up the road? Black Mountain’s theory is that low prices are, in fact, the best way to stay in business: when you’re surrounded by great ski hills, you have to distinguish yourself somehow, and price is one way to do it. The formula seems to be working. According to Arsenault, business has tripled since Black Mountain lowered its prices, and I’m not surprised. When I went last February, a foot of light, powdery snow had just fallen, and the skiing was perfect. The mountain itself is big enough (1,380-foot vertical drop) and the trails varied enough to welcome skiers of all skill levels. 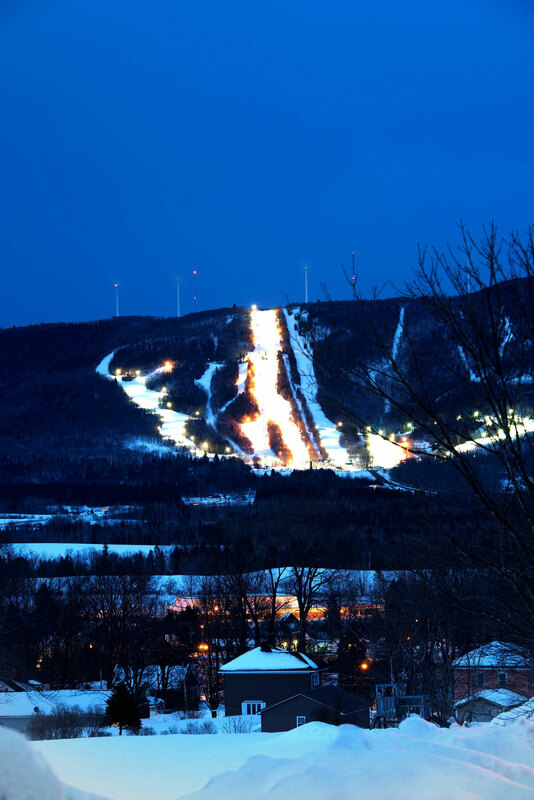 As general manager Jim Carter put it, “This is not a $15 mountain.” Okay, so a lift ticket costs $25 on weekends, but Black Mountain is no $25 mountain either. It’s worth much more than that, and my oldest son and I were so happy skiing there. When we left, though, I started to feel melancholy. Lift tickets were also cheap back at old Shu-maker Mountain, where I grew up skiing in New York. And it also made me happy to ski there, even though I wasn’t much good at it. Then, in 1999, it went out of business, and the hometown that I love feels emptier for it, like we’ve lost something vital. So maybe we should ask ourselves two questions when deciding whether to ski someplace like Black Mountain or Bigrock this winter: How much will we save if we go? And how much will we lose if we don’t? We like the big hills too! Check out the video of Down East‘s day at Sunday River with the volunteers and participants of Maine Adaptive Sports & Recreation. For more on Maine’s community hills — including the creative means that some small hills are employing to keep the lifts running — grab a copy of our February 2015 issue. Brock Clarke is the author of the novels The Happiest People in the World and An Arsonist’s Guide to Writers’ Homes in New England, among other books. He lives in Portland.